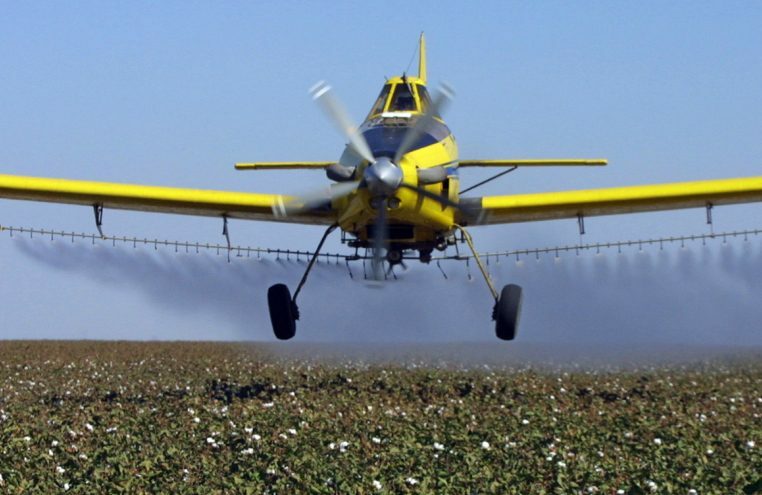 The new rule dictates when and where farmers can spraying certain pesticides. SAN FRANCISCO — California has banned farmers from using certain pesticides near schools and day care centers under a new rule announced Tuesday that regulators said is among the toughest in the U.S. Under the new rule, California farmers will be prohibited from spraying pesticides within a quarter mile of public K-12 schools and licensed day care centers from 6 a.m. to 6 p.m. during the school week, the state Department of Pesticide Regulation said in a statement. The new regulations take effect Jan. 1 and apply to crop dusters flying over fields, air blasters spraying orchards, and fumigants along with most dust and powder pesticides that could be blown onto school grounds by the wind. “These rules will help to further protect the health of children, teachers and school staff from unintended pesticide exposure,” Brian Leahy, the department’s director said in the statement. Some California counties already require buffer zones between schools and areas where pesticides are sprayed on crops. But the new rule is the first statewide standard of its kind, the department said. It is meant to safeguard about 4,100 schools and day cares and will affect about 2,500 California farms, officials said. Violators will face fines up to $5,000. Farmers will also be required to annually tell schools and county agriculture offices about the pesticides they expect to use near school buildings.